A fashionable modern take on traditional Puglian living. Villa San Vincenzo is a stunning secluded estate set in an enchanting olive grove, deep in the heart of the Puglian countryside but close to the vibrant seafront town and beaches of Gallipoli. The two luxurious villas, which thanks to the service and your own 24/7 concierge feel like a private hotel, have been lovingly restored to combine traditional Salento architecture, modern luxury, charming gardens and a state of the art pool and outdoor cinema. Inside: Villa San Vincenzo comprises two adjacent villas, equal in their quality, individual in their layouts, immersed in the same lovely gardens. In the larger villa, one enters the spacious, airy living area with its comfortable sofas and plasma screen TV. The three double-twin bedrooms, all accessed from the main living area, are tastefully furnished and come with en-suite shower bathrooms, two with shower and one with tub and shower attachment. Also accessed from the living room is the stylish, cornflower blue kitchen. The entrance of the second property, the garden villa, takes one into a cosily furnished living area with large fireplace. From here a large archway leads one into the kitchen and dining area. At either end of this open-plan living-dining-kitchen area are the two double-twin bedrooms, both with en-suite bathrooms. All bedrooms have iPod/iPhone docking stations, as do the living areas. 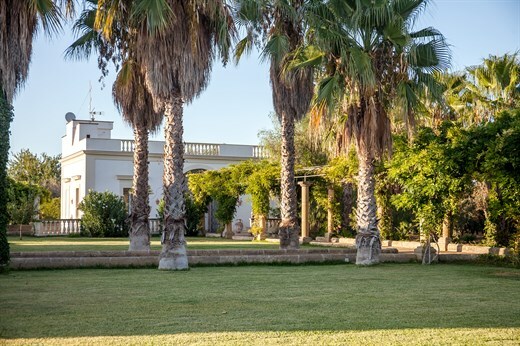 Outside: Villa San Vincenzo's gardens are a mix of olive groves, fruit trees, leafy arcades and palm-tree-flanked paths! Guests may choose from two al fresco dining areas; one outside the main house, the other near the pool. As lovely as the gardens are, you may find you spend the vast majority of your time in the pool area, which boasts an outdoor lounge area with sofas and fireplace, an indoor kitchen, a bathroom and a shower room. The pool itself has a shallow paddling/beach area and is surrounded by comfortable sunloungers, from which you can work on your tan during the day or... wait for it... watch a film on the large pool-side screen in the evening... an unusual and intriguing touch of luxury! Service at Villa San Vincenzo: on top of the daily cleaning, clients at Villa San Vincenzo may also make use of a personalised 24/7 Concierge Service to meet your every need. The Concierge will help you tailor your holiday on a daily basis, and whether its hiring in local chefs for long lazy al fresco meals, in house massages, yoga, cooking classes, or making sure you find the best local hidden beaches and restaurants, nothing is too much trouble. For those of you who don’t want to laze in the sun by the pool all day, sailing, diving, and fishing trips can all be arranged. You can even arrange for your food shop to be there on arrival, with the Prosecco all ready on ice - so your holiday can start from the moment you get there! Take both houses or just one: you'll always have exclusive use of the grounds, facilities and pool! Travelling with another family or the grandparents? Having two villas is an ideal solution if you prefer to have a certain level of privacy. Within the grounds (and away from the houses and pool) there is also a beehive that produces delicious honey which guests can enjoy during their stay. Villa San Vincenzo is just 3 km from the charming town of Alezio and 7km from Gallipoli and the coast. Alezio has some superb baroque buildings, high quality shops and cafes, a market, restaurants and a relaxed, authentic feel. Gallipoli is a true jewel of a town, set on a fortified peninsular and featuring some fabulous architecture as well as lively night life and some great restaurants. The delightful baroque town of Lecce is just 40 minutes' drive, most certainly worth a visit. Tennis courts and horse riding facilities are within a 10-minute drive from the villa. "We had a wonderful stay at Villa San Vincenzo. Having two separate houses and the pool separate from that was perfect for our families with small children. The grounds were immaculately kept and it was a true oasis." We loved Villa San Vincenzo. I think the photos did not do it justice! I would like to personally thank the villa staff for their amazing hospitality during our stay. They were fantastic. The in-villa cook and pizza chef deserve an extra special mention for catering so well for my mum who is a coeliac. Every meal they made included gluten free options for her which was absolutely amazing. The food prepared for us were some of the best meals we had during our entire European summer holiday. We had a wonderful stay at Villa San Vincenzo. The house manager was incredible. He truly went above and beyond for us. The house was a perfect layout for our group. Having two separate houses and the pool separate from that was perfect for our families with small children. The grounds were immaculately kept and it was a true oasis. The view from the roof deck was incredible. It was lovely to have the fruit trees, gardens, olive trees, and honeybees. We really enjoyed that we could buy honey and olive oil from the estate. Villa San Vincenzo is an incredible, secluded oasis and the perfect to place to draw breath and relax in stunning, spacious surroundings. From the luxurious rooms, well stocked kitchens to the vast pool area and secret spots to take an afternoon nap - you're never short of spaces to chat or escape one another, depending on your mood. Last summer I made my 4th visit. Hopefully going back again soon. We all really loved our stay. Villa San Vincenzo is superb. Swimming pool area was just perfect for little children. The caretaker is such a lovely man and really made our stay special. The cook and her family and the masseuse were fantastic. Vila San Vincenzo was exceptional. The photos didn't do it justice. The pool is exceptional for young children. Great villa, great holiday. Villa San Vincenzo was of an extremely high standard. We really enjoyed the pizza chef. The pool area is great. Fantastic sun loungers and the cinema screen is fun. Martina the concierge was very special and absolutely made our stay stress free. Pity every villa hasn't got a Martina! Villa San Vincenzo is on the expensive side but having Martina, the fact it was very well equipped and all 3 kitchens very generously stocked, swimming area was great with the extra large sunbathing beds and wonderful to have the cinema for in-house entertainment. Could not fault it and neither could our guests. An idyllic country retreat with an amazing pool area, close to fabulous beaches and rustic restaurants, perfect for groups of friends. We had a fantastic trip. Villa San Vincenzo was everything we wanted and we would visit Puglia again. The staff are extremely helpful and the in-villa cook was exceptional. I just wanted to say a big thank you to you for all your help in organising what was a fabulous week at Villa San Vincenzo. The villas, gardens, location and pool were all beautiful and so, so peaceful. Martina and Paolo were brilliant, particularly Martina who couldn't do enough for us. Our only regret is that we didn't book for two weeks. The villa and the team totally exceeded our expectations. We were expecting it to be lovely but it was paradise. The staff were exceptional and nothing was too much trouble for them....I am so pleased we chose Villa San Vincenzo. It was totally special. Villa San Vincenzo is a wonderful combination of traditional Italy and chic understated glamour, making you feel instantly at home somewhere truly special. The old olive press buildings, now immaculate and stylish residences, are kept cool by the ancient knotted olive trees that surround them. The architectural pool area has everything you could possibly need for relaxing during the day and entertaining at night and it's tempting to never leave. Although, the fish restaurants in nearby Gallipoli and the beach at Porto Selvaggio are not to be missed. We had such a lovely holiday there that I would return in a heartbeat. I absolutely loved it. Property was generally of very good standard... The pool area, which was the main selling point to us, was fantastic... furnishings and technology of very high standard... The linens / towels etc were frequently changed and of excellent quality. The kitchen was good, and the pool kitchen a real plus. We loved the villa, it was seriously glamourous and comfortable. Every detail had been thought through and then perfected! We could not find a single thing to find fault with (& I'm a tricky customer!) The kids thought they had gone to heaven eating award winning ice cream from the local village whilst swimming and watching a movie at the pool - all the people at the villa were so helpful, nothing too much trouble. Villa San Vincenzo is a magical backdrop to the perfect week. The housing is stylish and comfortable, with many areas to explore in the special setting of the olive grove. I loved the local area - full of beautiful wooded coves and beaches to explore, restaurants with culinary delights. Would thoroughly recommend the local horse riding through pine woods and beaches - perfect for all levels of experience! Villa San Vincenzo is the epitome of peace, and consummate relaxation in short bliss. The warm welcome, the sumptuous surroundings, and the relaxed atmosphere are heaven.